2017 Invader Fold-up Camping Trailer for sale at Loftus Caravan City this 2017 Invader Fold-up Camping Trailer is FUL house and ready to camping on any off-the-beaten track camping. 1999 Desert Wolf Cub Off-Road Camping Trailer for sale at Loftus Caravan City this 1999 Desert Wolf Cub Off-Road Camping Trailer features an Echo 4x4 Trailer roof top tent! 2016 Jurgens Safari XT160 Off-Road Camping Trailer for sale at Loftus Caravan City. This 2016 Jurgens Safari XT160 Off-Road Camping Trailer offers a trailer tent, with awning this trailer is FULL house, 2 x gas bottles and a 220/12v system! 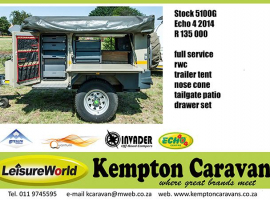 2011 Jurgens Safari XT75 Off-Road Camping Trailer for sale at Loftus Caravan City. This 2011 Jurgens Safari XT75 Off-Road Camping Trailer offers a trailer tent, patio awning and side wall set, 2 x gas bottles and a 220/12v system! 2018 Jurgens Safari XT120 Off-Road Camping Trailer for sale at Loftus Caravan City this 2018 Jurgens Safari XT120 Off-Road Camping Trailer features a Trailer roof top tent and a nose cone travel blanket. 2011 Echo 3 Off-Road Camping Trailer for sale at Loftus Caravan City this 2011 Echo 3 Off-Road Camping Trailer features a Trailer roof top tent, Patio awning, 2 plate gas stove and a 220v 12v system! 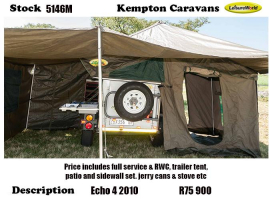 2015 Jurgens Safari XT160 Off-Road Camping Trailer for sale at Loftus Caravan City. This 2015 Jurgens Safari XT160 Off-Road Camping Trailer offers a trailer tent, with awning this trailer is FULL house, 2 x gas bottles and a 220/12v system!